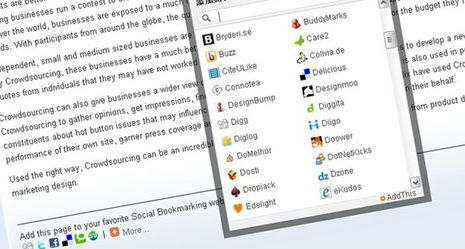 Advanced Social Bookmarker is a small joomla plugin services to your articles with AddThis.com technology, it records every click from your readers. You can view your site statistics to see what’s being shared & where. Display individual buttons for the social networking sites of your choice (Over 170 popular sites to choose from). To the right of your individual site buttons is a ‘More…’ popup window that lists over 170 social bookmarking options for your readers. This plugin is easy to install & configure, & makes it easy for your visitors to submit articles & build traffic to your site. I like what you posted here. I enjoy reading other sites about online marketing. It’s such an exciting area. I have been researching search engine optimization lately. Any tips? Thanks again for a very informative site! Click here if you’d like to check out my site.